.A team bearing the Thirroul name has been playing since 1892, although there is evidence to suggest football was played in the area - previously known as Robbinsville - from an even earlier date. 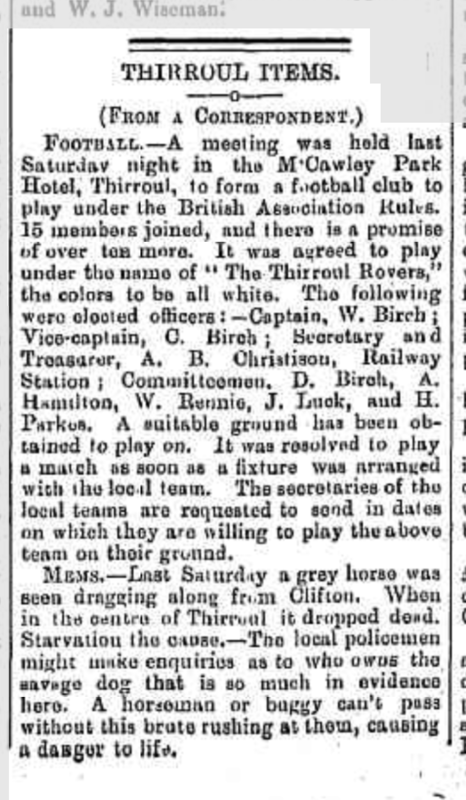 The Thirroul Rovers were formed at a meeting at the McCawley Park Hotel (now Ryan's Hotel) on 21st May, 1892 and begun playing soon after in a five team competition run by the Southern British Football Association. Other teams included Balgownie Rangers, Helensburgh Rovers, Corrimal and Woonona Swifts, who were founded shortly after the Thirroul club. According to newspaper reports from the time, Robbinsville Public School fielded a team in the junior competition, along with Balgownie Rangers, Helensburgh Rovers and the Moonlight Club from Wollongong. A report in the Illawarra Mercury on Tuesday, May 24, 1892 said that 15 members had joined the Thirroul Rovers at the meeting the previous Saturday night and there was "a promise of more to come". The elected officers were: Captain, W. Birch; Vice-captain, C. Birch; Secretary and Treasurer, A. B. Christison; Committeemen:, D. Birch, A. Hamilton, W. Rennie, J. Luck, and H. Park. Thirroul Rovers first match was played at home on June 4, 1892 against Helensburgh Rovers, who went on to win the Heal Cup that season. It was reported that Thirroul Rovers played in all white kit. The Illawarra Mercury reported on Thursday, June 2, 1892 that the team selected for the club's first match, kicking off at 4pm, was: Goal: W.Birch; backs, C.Birch, D.Birch ; halfbacks, Hamilton, Smith, Houston; forwards, Luck, Rennie, Beecham, Parkes, Chrisitson. Emergencies, Lewis, Hicks, Hilton. June 4.: Thirroul Rovers 0 Helensburgh Rovers 0 at Thirroul. June 18: Balgownie Rangers 2 Thirroul Rovers 1 at Centennial Grounds (North Wollongong). July 1: Thirroul Rovers 1 (G Smith) Balgownie Rangers 3 at Thirroul. July 30: Thirroul Rovers 5 (Rennie 3, J Luck, Harris Howson) Corrimal 0 at Thirroul. Ref: T Round (Robbinsville). Other Thirroul players mentioned in the Illawarra Mercury were Smith, Lewis and Birch. August 6: Woonona Swifts 2 Thirroul Rovers 3 at Heals Recreation Ground (Woonona). August 6: Robbinsville Public School 2 Woollhara Public School (Sydney) 3 at Thirroul. August 13: Helensburgh Rovers 15 Thirroul Rovers 1 at Heals Recreation Ground (for the Heal Cup). August 24: Thirroul Rovers 3 Woonona Swifts 2 at Thirroul. In one match, Thirroul were reported to have worn red stockings (socks).